The key is to control the game. If we have the ball, he’ll participate less and cause us fewer problems. The above quote by Gerard Piqué about Cristiano Ronaldo ahead of the semi-final with Portugal summed up Spain’s approach during the European Championship. In a typically excellent piece by Sid Lowe for the Guardian (from which the above quote is taken), Spain’s approach is described as being anaesthetic rather than aesthetic. The crux is that by controlling the ball, Spain are able to control the opposition by limiting their potential scoring chances, create chances for themselves and ultimately win football matches. More generally, Jonathan Wilson wrote during the group stages about the contest between one proactive and one reactive team being one of the dominant themes of the tournament. This has generally been the case in the knockout stages as well. This has essentially boiled down to one team having a lot of the ball and making the running, while the other is happier controlling space and attempting to keep the game close and to score on the counter attack. In essence, there is a battle to either control possession or to control position. The question is: can we separate this via the available data? In a previous article, I explored the ratio between shots attempted and conceded and short passing across the top five European leagues. There was a clear trend in the data, which is also apparent in the data from the European Championship shown below. The relationship is slightly weaker (correlation coefficient of 0.75 if you are that way inclined, whereas the league analysis had a correlation coefficient of 0.8) and it should be stressed that the amount of data here is much lower (only 16 teams who have played 3-6 games each). Relationship between shots attempted:conceded vs short passes per game from all teams in the 2012 European Championship. The vertical dashed black line indicates the average number of short passes per game by these teams, while the horizontal dashed black line indicates the average shots attempted:conceded ratio. The grey lines are the averages for the top five European Leagues for comparison. The teams are coloured by their goal difference for the whole tournament and sized by their goals to total shots ratio. All data is taken from WhoScored.com. Based on this analysis, the proactive teams would be classed as Spain, Germany, Italy, Russia, France and the Netherlands. 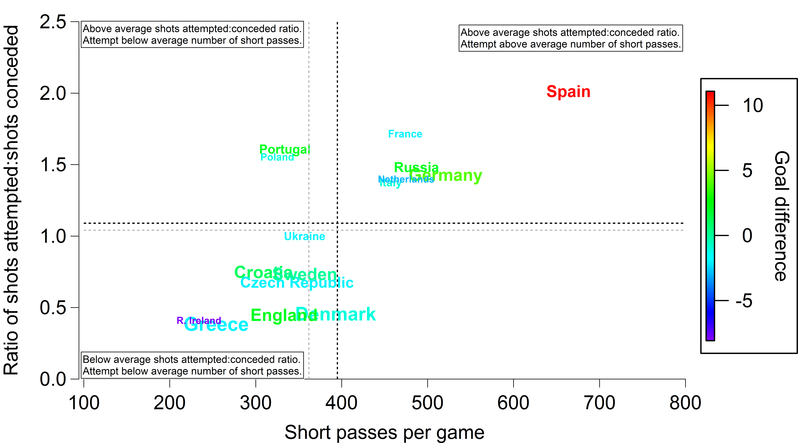 Spain unsurprisingly out-pass every other team in the competition and this adherence to a short passing approach sees them create significantly more shooting opportunities than they concede. Portugal and Poland are interesting in that they significantly deviate from the overall trend, with a comparable shot ratio to the proactive teams (aside from Spain) despite attempting 150-200 less short passes per game. This suggests that even though they have comparatively little of the ball, they are efficient at creating shooting opportunities for themselves relative to the number of opportunities they concede to their opponents. This contrasts markedly with teams like England, who concede many shooting opportunities and struggle to create shooting opportunities for themselves. The “worst” teams on both metrics are the Republic of Ireland and Greece, with the major difference between these two teams being their respective goal-to-shot conversion (4% vs 16%). Are all shots created equal? One point that should be discussed is that the above data could be skewed quite easily given the small sample size. For instance, many of the shots that England conceded were from distance (67% in fact, the highest proportion in the tournament) which would reduce their shot ratio. Many of these shots might have had little prospect of going in. Based on data from the Premier League over the last 4 seasons, analyst Dan Kennett showed that only 1 in 44 shots from outside of the box end up as a goal. Indeed, WhoScored reported that only 11% of the goals scored in the whole tournament were from outside of the box. In order to explore this more, I’ve calculated the number of shots a team attempts and concedes within the penalty box. Note there may be a small rounding error in these numbers as the percentage values from WhoScored are rounded to the nearest whole number. Number of shots attempted and conceded by teams at the 2012 European Championship. The vertical dashed black line indicates the average number of shots conceded inside the box per game by these teams, while the horizontal dashed black line indicates the average number of shots attempted inside the box. The teams are coloured by their goal difference for the whole tournament and sized by their goals to total shots ratio. Values are calculated from data from WhoScored.com. There is generally a negative trend (correlation coefficient of -0.54) as teams who attempt more shots in their opponent’s area also concede fewer attempts within their own. Spain led the way in terms of conceding shots within their own penalty area, with the Republic of Ireland being the worst performers on this metric. Spain also ranked third for shots attempted within their opponent’s penalty area, with only Russia and the Netherlands ahead of them. This is impressive as Spain achieved this over 6 games rather than 3, with the likelihood being that the Netherlands and Russia would have regressed towards the mean somewhat if they had reached the knock-out stages. Based on the identified proactive teams above, Spain, Germany, Russia and the Netherlands were particularly incisive in that they attempted an above average number of shots in the area. Russia and the Netherlands were possibly somewhat let-down by their more average shots conceded values. Portugal and Poland again did well on these metrics, lending added evidence that they were highly efficient in their play. By calculating the actual number of shots attempted and conceded gives a better appraisal of how well particular teams did in terms of these shooting metrics, which are more likely to see goals scored or conceded. 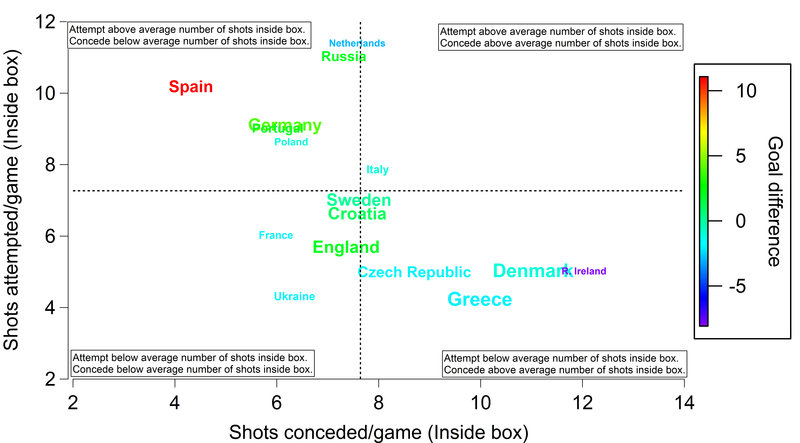 While England’s relative proportion for shots conceded outside-to-inside the area sounded impressive, their actual number of shots conceded in the box was distinctly average. In essence, England’s impressive percentage was driven by their opponent’s taking lots of long-range shots, which was likely a result of their deep back-line and midfield. However, such tactics weren’t particularly successful at restricting their opponents, with England only significantly outperforming Greece, Denmark and the Republic of Ireland. Spain’s quest for control was undeniably successful as they won the tournament and tended to dominate many of the metrics investigated here, as well as many others. Most goals scored and fewest conceded is an impressive achievement and this was likely driven by their ability to create shooting opportunities in their opponent’s penalty area, while simultaneously conceding very few in their own. England on the other hand, don’t come out of this particularly well. It’s unrealistic to expect England to be able to play the highly-technical progressive and proactive football espoused by Spain but if England continue to play reactive football, which is likely under Roy Hodgson, they will need to be far more efficient when it comes to creating their own chances and negating the opposition. England had very similar passing statistics to Portugal but they had hugely different statistics regarding shots attempted and conceded both overall and within the penalty area. Is it unreasonable to suggest that England should look to increase their efficiency in this regard to somewhere approaching that of Portugal (or even Poland for that matter)? Such an improvement would be a far better platform for long term success, without getting carried away with notions of tiki-taka. Much has been written since England’s exit from the European Championship, with a significant focus upon the statistical dominance of Italy in terms of passing and shooting. I’ll not tread over old ground too much but I wanted to highlight one aspect that struck me during the match, which was later confirmed after looking at the statistics. It struck me that England appeared to go long periods without having the ball at all. Below is a figure showing the number of passes attempted by Italy and England over the entire game in 5-minute chunks using data from Squawka. The striking thing is that England had several periods where they attempted fewer than 10 passes in 5 minutes. Incredibly, England only attempted 3 passes between the 55th to 60th minute. If that wasn’t shocking enough, they didn’t actually complete any of those 3 passes! Italy on the other hand, never dropped below 20 passes in 5 minutes. Top graph: Number of attempted passes by England and Italy in their European Championship Quarter-Final as a function of time. Bottom graph: Ratio of the number of passes attempted by Andrea Pirlo to the number of passes attempted by the whole Italian team against England. Data is courtesy of Squawka. 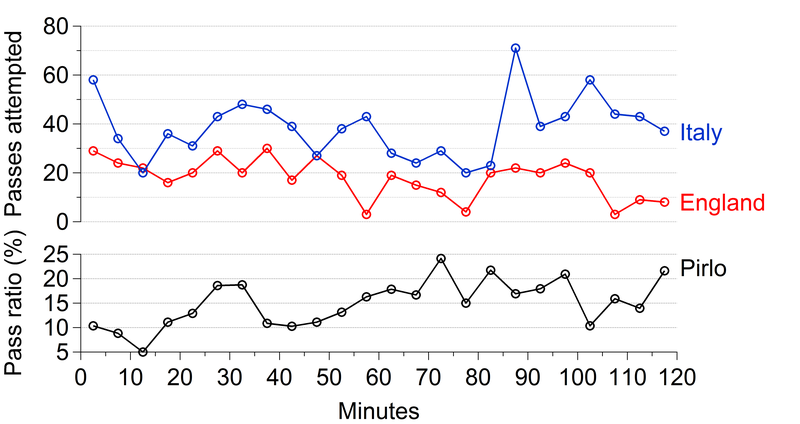 England’s best periods tended to coincide with them actually having the ball a reasonable amount, especially in the first 30 minutes of the match. 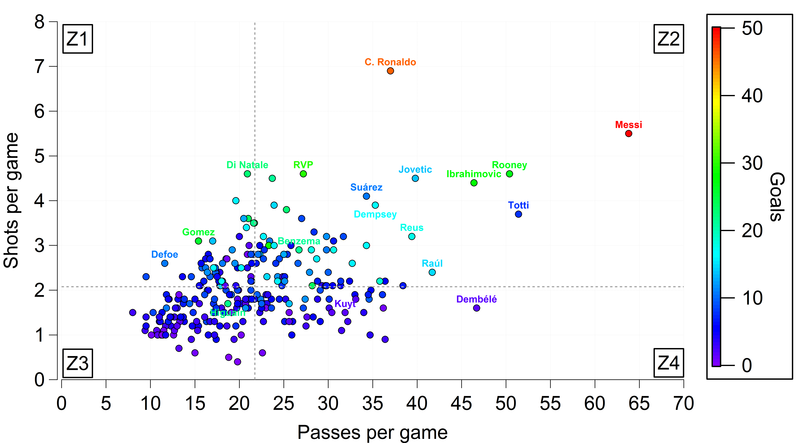 Overall though, Italy were generally well ahead of England in terms of passing. Any piece mentioning passing in the England vs Italy game should reserve some mention for Andrea Pirlo and his impressive play-making performance. However, there is likely an element of Pirlo being allowed to put on such a performance. Indeed, his influence upon the game tended to ebb and flow, which is shown by the bottom graph in the figure above. This shows the percentage of Italy’s attempted passes made by Pirlo for each 5-minute portion of the match. In the first 15 minutes, Pirlo’s influence was rather low with only 5-10% of Italy’s passes being attempted by him. This grew to the point where close to 20% of Italy’s passing was going through Pirlo from the 25th to 35th minute. His involvement then dropped off again by grew steadily up to the 65th minute from which he maintained a high involvement apart from a short period in extra-time. England clearly managed to negate Pirlo’s influence early in the match but this was not repeated later in the match. In the second half of normal time and in extra time, about 1 in every 6 of Italy’s passes went through Pirlo. This allowed Pirlo the opportunity to dictate the game, culminating with his extraordinary penalty kick. I don’t regard possession statistics as showing who is a good or bad team [but] we know we need to be better with the ball. That is where we have to keep working. Hodgson has a point about possession in the above quote. However, England’s apparent disregard for the ball and/or inability to regain it made life very difficult for them against Italy. In order to score, you do need the ball at least a reasonable amount and be efficient with it, which was illustrated in the second half of extra time as England completed only 8 passes out of 20 and had zero shots on goals. England demonstrated in the group stage that it is possible to be successful with about 40% of the ball but at times they had less than 10% against Italy. At least Hodgson has admitted that there is a problem in this regard. Whether he is the man to solve it is an entirely different matter.